The enormous advances in the diagnosis and treatment of the past few years have made the management of vein problems precise and patient-friendly. The wonders of ultrasound-painless imaging of the veins, non-invasive, affordable, accurate-make it possible to actually see the veins under the skin and test their function just by placing a water-based gel and a light probe connected to a computer on the skin. The information is precise and it has become the major source of venous diagnosis in the lower extremity. In addition, advances in minimally-invasive endovascular catheter treatment methods and innovations in special techniques of injection procedures allow effective treatment of 9 out of 10 vein problems. This is done in the office setting with minimal discomfort and almost zero loss of time from normal activity. Varicose veins are much more serious since they frequently cause persistent discomfort and swelling and produce a measurable effect on the individual’s quality of life. Varicose veins do not heal without treatment and they may progress to more advanced problems in the legs with the passage of time. The advanced complications of skin changes from venous reflux disease can result in discoloration, thickening, and non-healing ulcers (sores) in the skin of the lower legs. These advanced changes are thought to be largely preventable by appropriate treatment of the abnormal veins earlier in life. Treatment is individualized in the Kistner Vein Clinic to the simplest effective method appropriate to the diagnosed problem. These treatments can be done with near immediate return to daily activity for most cases. 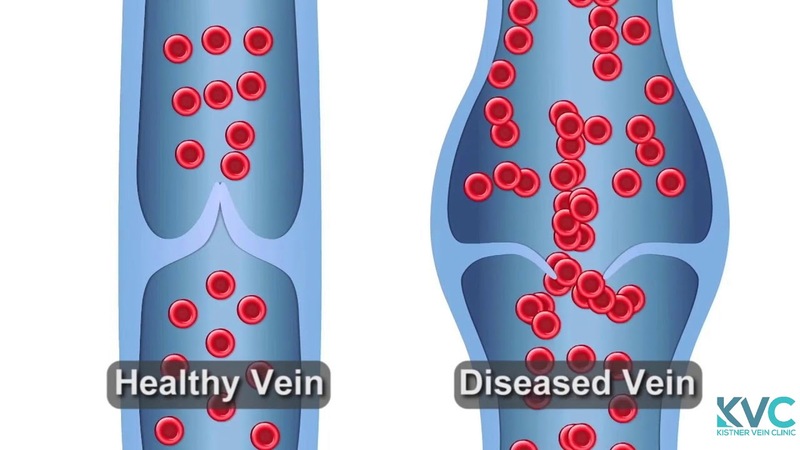 Acute vein disease consists mainly of blood clots (phlebitis) and their complications. A blood clot in the leg should be suspected when there is swelling or pain in one leg that does not have an obvious cause, such as an injury. Such an occurrence is best investigated with an ultrasound examination, called a ‘duplex scan’. This is a painless and non-invasive test that is widely available in hospitals and emergency rooms and specialty offices. The emphasis should be on making the diagnosis early (within 3-5 days) to prevent any possible mortality. Untreated blood clots in the deep veins of the leg may travel to the lungs and block blood flow to the vital organ that can lead to fatality. Effective treatment requires careful follow up to confirm the clotting process has been stopped to prevent new clots from forming and to prevent serious complications.